Some kind of musical artistry dances in the magic of a “mix tape.” Hand picked tunes set in just the right order to create just the right sentiment for just the right person. The result is a collection of music that is personal and intimate. A present that doesn’t need a card attached. The message is in the music. Mix tapes have staying power. Compilation albums, albums comprised of various artists, can have the same impact when curated well. Mighty Mo Productions, a Kansas City-based indie record label started by Jim Cosgrove and Tim Brantman are curating music with the intent of delivering the same sentiment and appreciation as a mix tape. As a follow up to their 2015 debut Smiles Ahead, Mighty Mo Productions returns with Heart Beats: Feel Good Songs for Families, an album full of songs that are primed to bring you warm fuzzies. Heart Beats assembles some of the same artists featured on Smiles Ahead such as Caspar Babypants, Brady Rymer, Katydid, Rissi Palmer and The Verve Pipe as well as newly added Ratboy Jr., Sunshine Collective, Joanie Leeds and the Nightlights, Andrew & Polly, Josh and the Jamtones and label creator, Jim Cosgrove (featuring Jazzy Ash). It’s a Who’s Who line-up of the indie kids music genre. The 12 tracks swirl around the album’s overall theme: Love. Most tracks land solidly on the message of I Love You while The Verve Pipe’s “One Became Two” touches upon family, Brady Rymer’s “Light of Love” rallies for listeners to send joy out into the world, and Katydid’s “Love My Lovey” gets bonus points for its superhero ode to childhood “loveys.” (Perhaps a child’s most loyal love, aside from mom and dad, of course.) Joanie Leeds’ voice soars on the comfort of a goodnight hug and kiss in “Give Me A Hug,” and Ratboy Jr. gets tender with “E’s Lullaby” to cap it all off. Music is a gift, and giving the gift of music is something really special. Heart Beats arrives just in time for Valentine’s Day, and really is worth a spin to lift the mood anytime. But don’t take my word for it. Listen to the 7-year-old girl in the backseat who shouted “Turn it up!” so she and her best friend could sing along together. That, my friends, is what heart beats are made of. Heart Beats is available for purchase through the Mighty Mo official site where you can also listen to samples of each track. Saturday, January 30 at 11 am – Amy’s Hallmark Shop, Manhattan Village, Manhattan Beach, CA – a morning sing-along featuring Andrew & Polly, Jim “Mr. Stinky Feet” Cosgrove and Mista Cookie Jar (featured on Mighty Mo’s first album release, Smiles Ahead). Save 10 percent on CD purchases that day! FREE admission. Sunday, January 31 at 11 am – McCabe’s Guitar Shop, Santa Monica, CA – a full-length family sing-along with Andrew & Polly, Jim “Mr. Stinky Feet” Cosgrove and Mista Cookie Jar. Tickets: $10 each (kids under 2 free). Saturday, February 6 at 11 am – Amy’s Hallmark Shop, Airport Plaza, Farmingdale, NY. A sing-along with 2-time GRAMMY Award nominee and North Fork resident Brady Rymer, Brooklyn based kid-pop star Joanie Leeds, and Jim “Mr. Stinky Feet” Cosgrove. Save 10 percent on CD purchases. Free admission. Saturday, February 13 at 11 am – Amy’s Hallmark Shop, Crown Center, Kansas City, MO. A sing-along with KC based artists Katydid and Jim “Mr. Stinky Feet” Cosgrove. Save 10 percent on CD purchases. Free admission. Recently, Play Date released a video and it’s L-O-V-E-L-Y. Together, Gregory Attonito and Shanti Wintergate (husband-wife duo) capture the spirit, mystery, playfulness and omnipresence of love. It’s such a sweet video to accompany an equally heartwarming song. Take a listen and then go spread some of that warmth to the loved one(s) in your life. 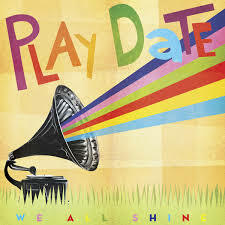 “L-O-V-E You” is a single from Play Date’s most recent release We All Shine which can be purchased through Play Date’s merch site.